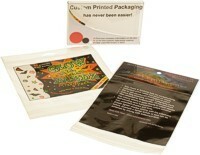 ClearBags® is a USPS approved poly wrap manufacturer for our Crystal Clear Bags and Envelopes, and 1.6 mil Eco Clear Bags. Mailings using Crystal Clear Bags may be used and tested for any weight up to: 13 ounces for First-Class Mail, 20 ounces for Periodicals, less than 16 ounces for Standard Mail, and 20 ounces for Bound Printed Matter. Other requirements from the USPS concerning Bulk Mailings, Presorted Mailings, First Class and Standard Mail may apply to your mailings. Before mailing for the first time check with the local post office for compliance with postal regulations and possible surcharges. To help you know the shipping standards better and how to ship your mailers, there is a reference form. The PDF from the USPS goes over the flexibility, sticker requirements, as well as length, height and weight. See the PDF at the USPS site. The U.S. Postal Service announced the first in a new series of postage stamps that will make it easier for card customers to know how much postage to put on their envelopes. Letter-size mail pieces are considered non-machinable and subject to a non-machinable surcharge if they are polybagged, polywrapped, or enclosed in any plastic material. This does not apply to bulk mailers or flats. Letters that meet one or more of the nonmachinable characteristics in DMM 101.1.2 are subject to a $0.20 nonmachinable surcharge per piece. Discount levels, regulations, and non-machinable surcharges vary based upon class of service and other factors. Consult the domestic mail manual: https://pe.usps.com/ , or find a Mail Piece Design Analyst to assist you. The wrap direction must be around the longer axis of the mailpiece, with the seam parallel to that axis. The longer axis is always parallel to the length of the mailpiece. The preferred seam placement is on the nonaddressed side of the mailpiece. If the seam is placed on the addressed side, the seam must not cover any part of the delivery address and barcode, postage area, or any required markings or endorsements. Regardless of seam placement, the polywrap over the address area must be a smooth surface to avoid interference with address and barcode readability. When mailing in our clear or translucent envelopes, be sure to use self adhesive postage stamps. These products work great for mailing.